Setup for online entries is quickly and easily completed within your Windows Fair Management software. The Online Entries site is open to take entries 24 hours a day, seven days a week. Exhibitors will visit the Fair's website at their convenience where they will find a link to the Fair's Blue Ribbon Fair Online Entries Site. The exhibitor will create an account and make their entry selections; they can return to their online account another day to complete their entries or after completing entries on one day can return another day to select more entries. The fair has the ability to define different entry deadlines for different types of entries. Taking entries online relieves your staff from a large data entry burden. Processing hand written entry forms takes time and resources that are increasingly scarce. Promoting your online entry site will reduce staff workload and data entry errors. With the click of a button as often as you choose, your online exhibitors and their entries will effortlessly merge into your Windows Fair Management program data. Not only will Blue Ribbon Fair Online take entries, but it also lets you sell admission tickets, gate passes, parking passes, and even general admission grandstand entertainment tickets. The per online account convenience fee is charged but no additional fee or percentage is charged for additional item sales. 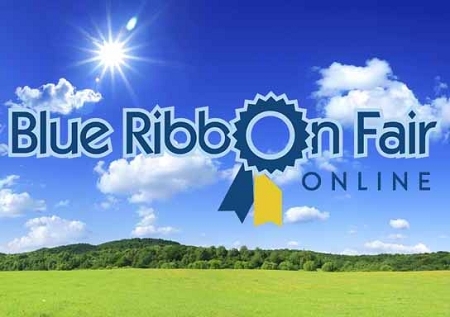 The fair does have the option to accept credit card payments thru the Blue Ribbon Fair Online Entries site. The requirement is that the fair obtain a merchant account associated with one of the payment gateways supported by the online entries site. Ask for details. If the fair does not need to or want to accept credit card payments online, there is a "no credit card processing" option available. If the fair charges fees to the exhibitor and chooses the "no credit card processing" option, then the fair will arrange to receive payment from the exhibitor outside of the online entries site.